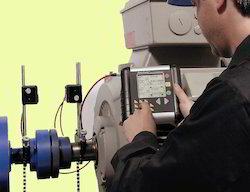 Our Alignment Services include rotating shaft alignment, using imported Brands of precision laser systems. 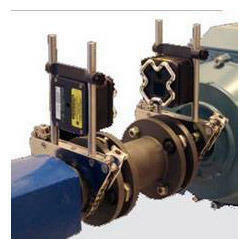 We provide complete shaft alignment services. The center point of connected shafts such as a drive motor to a gear box must be concentric for trouble free operation. If not, problems such as vibration, bearing and coupling failure and mechanical wear to parts will exist. With the use of a laser alignment system and our trained and experienced personnel, Clients are assured of a proper job. The old days of magnetic bases, dial indicators and shaft sag have given way to methods of Laser shaft alignment, which are much faster, more accurate and far superior. Perfectly aligned Machines reduce Vibration, Machine break-down, Production loss, Energy consumption, Bearings and other parts failure, Coupling wear and Shaft breakage. In short, long land trouble free Machine performance is the ultimate advantage of Laser Alignment. Pumps, Motor / Alternators / Gear Boxes / Cooling Tower Assembly / Turbines Spindles / Flexible couplings and any type of drive and Machine Assembly. We have gained immense reputation by offering efficient Laser Alignment Services. 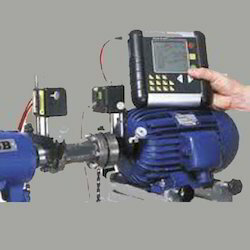 We own a wide range of laser alignment sets to check the configuration and placement of various industrial equipments along with various hi-end motors and pumps. Our offered services are rendered by skilled professionals, which can be availed at lowest price in the industry. Precision alignment of machinery is accomplished at installation or during maintenance/repair through the use of précised Laser Shaft Alignment Tools. Our methods of machinery alignment is far superior in terms of accuracy, speed and job site adaptability than out-dated methods. 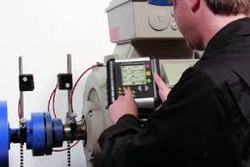 Our alignment tools and methods used during machine installations speed up the process of getting equipment up and running and ensure infield quality control for machinery setting. A definite breakdown in precision exists between the fabrication and buildup of machinery in a fabrication shop to the installation, in the field. The general condition of machinery and the ability to maintain precise alignment starts at the foundation; proper footings, installation of sole plates, proper anchoring and grouting are all key factors to consider when installing machinery of any kind. Our expertise in these areas is a valuable resource. Perfectly aligned Machines reduce Vibration, Machine break-down, Production loss, Energy consumption, Bearings and other parts failure, Coupling wear and Shaft breakage. In short, long land trouble free Machine performance is the ultimate advantage of Laser Alignment. We are one of the leading entities involved in rendering professional services for Laser – Alignment. Our workforce is trained to provide efficient laser alignment that is implemented with faster response times as compared to the traditional alignment methods. Thereby, for reduced risk of breakdown and increased life span of rotors, pumps and other equipments avail our cost effective services.